This is another variety rice we make in case we don't have anything to make. Most of us will have a bunch of cilantro or parsley leaves in our fridge. We can use this for making this rice. Here is the recipe. Pea nuts - few for garnishing. First wash and pressure cook the rice upto 2 whistles and keep it aside. Let it cool. In the mean time, take a pan, fry the ingredients given for powder, one by one, to golden brown. Let it cool and grind it into a fine powder (it may not come like a powder. But its ok). 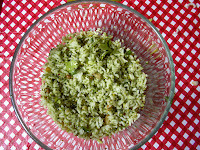 When the pressure cooker is ready to open, spread the rice in a wide pan and let it cool. Take a pan, pre heat oil, add mustard seeds when it splutters, add urad dhall, green chillies, ginger, cashew, peanuts and curry leaves and fry it till golden brown. Do not burn the ingredients. Pour the ingredients on top of rice. Add required amount of salt, required amount of parsley powder ** and mix everything well. Serve it with raita. ** - store the extra powder for next time.